As an aside, the Alberta government has apparently taken cutbacks too far. I had tried to book (and pay for) campsites before leaving, but they cannot be booked online, and the phone reservations are not opened on Sundays to Tuesdays. Without driving an extra 200km to the only remaining visitor center, there is no way to book sites at the last minute. I did not feel bad, since I had booked sites that I hadn’t used several times that summer already. Our second day involved some technical riding, was almost entirely uphill, and was substantially longer than the first day. 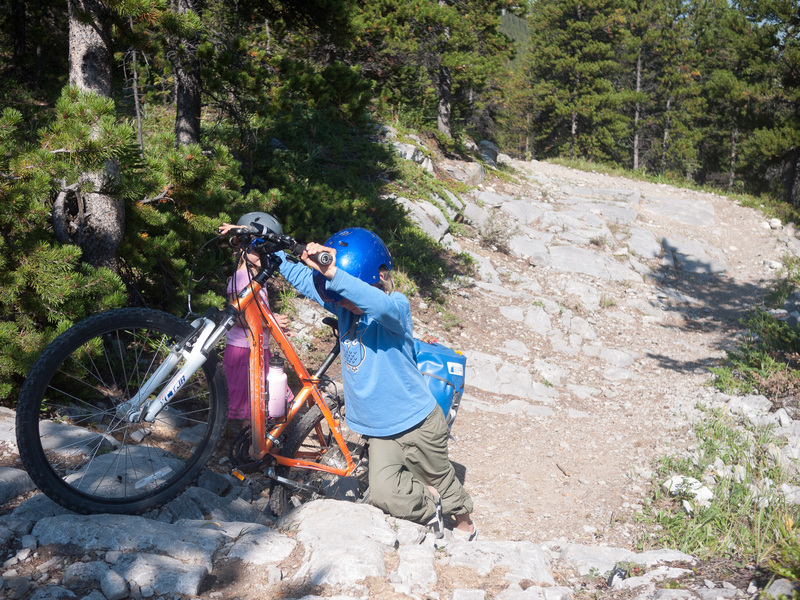 Neither I, with my heavily loaded bike and Burley Piccolo tag along, nor Tadhg with his MTB and pannier were up to the task of climbing the more technical parts of the trail. In fact, anything beyond a fairly mild grade was beyond us. Fortunately, both of us are fairly skilled at bike pushing, and we did a good amount of it. Fiona alternated between walking and pedalling on her tag-along. 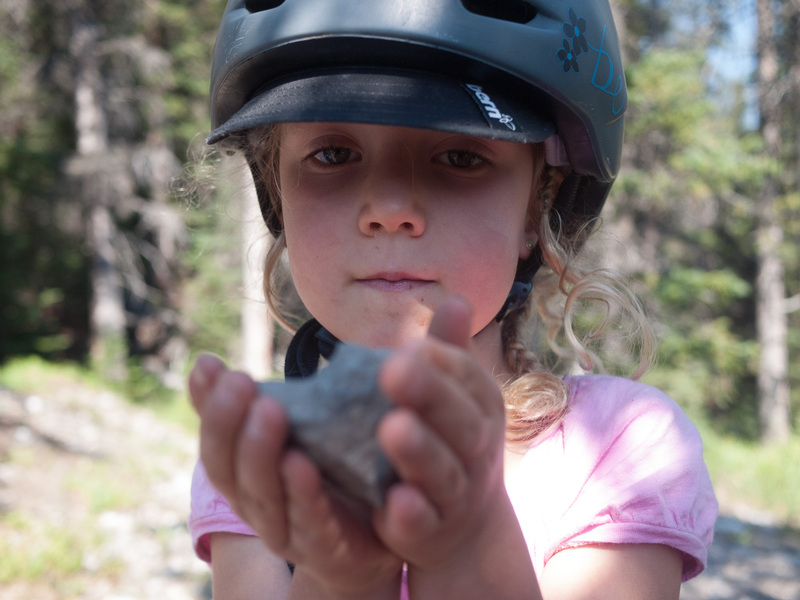 We had the good fortune of meeting another touring cyclist in the Tombstone campground. Tadhg was thrilled to be able to pump some filtered water for him so as to prevent his getting Giardia from the water. 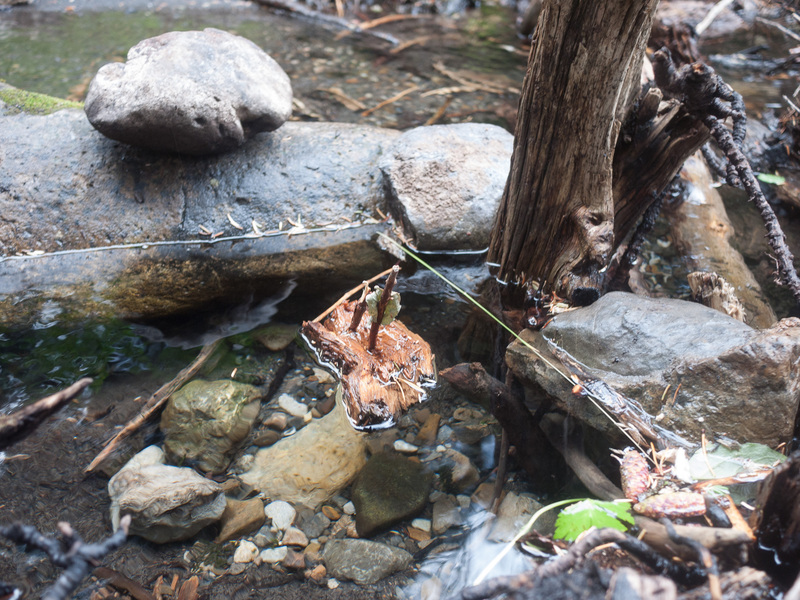 He had been drinking straight out of the creek. He was riding on road wheels and had not been very impressed with the technical trail sections. 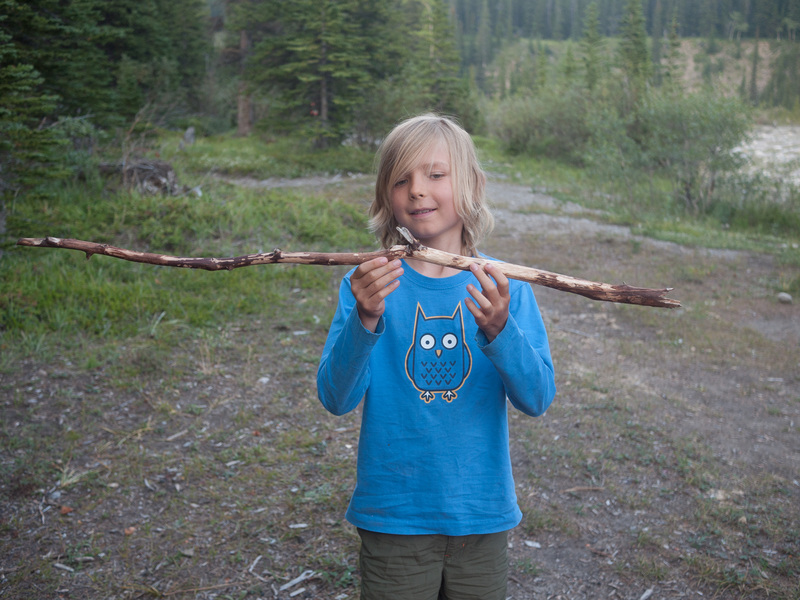 Our third day was to be relatively short, from Tombstone to Elbow Lake campgrounds. 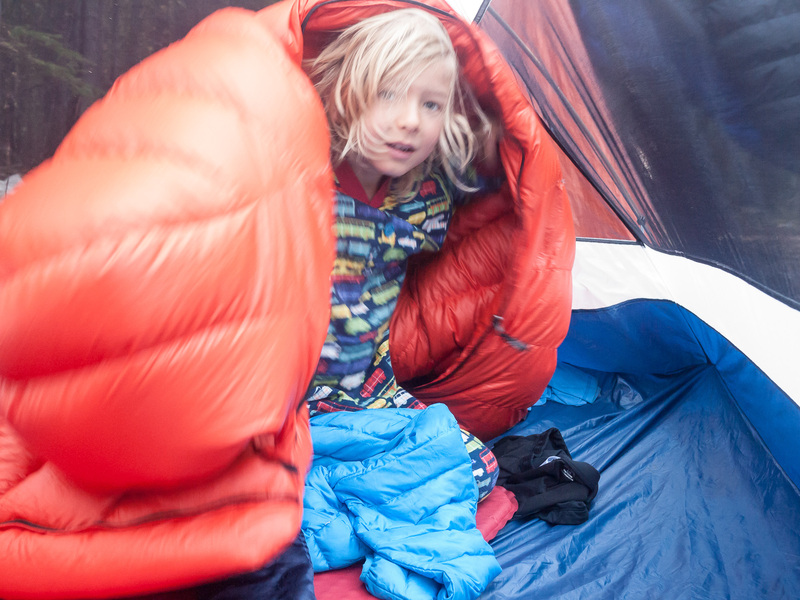 Conveniently, it rained for most of the early morning, which gave us an excuse to lay about the tent until after 9 am. We hit the trail soon after for some more riding and pushing. The trail from Tombstone to Elbow Lake is a little rough and is covered by large rocks in many places. It was not all that rideable for Tadhg, but at least it was short and scenic. 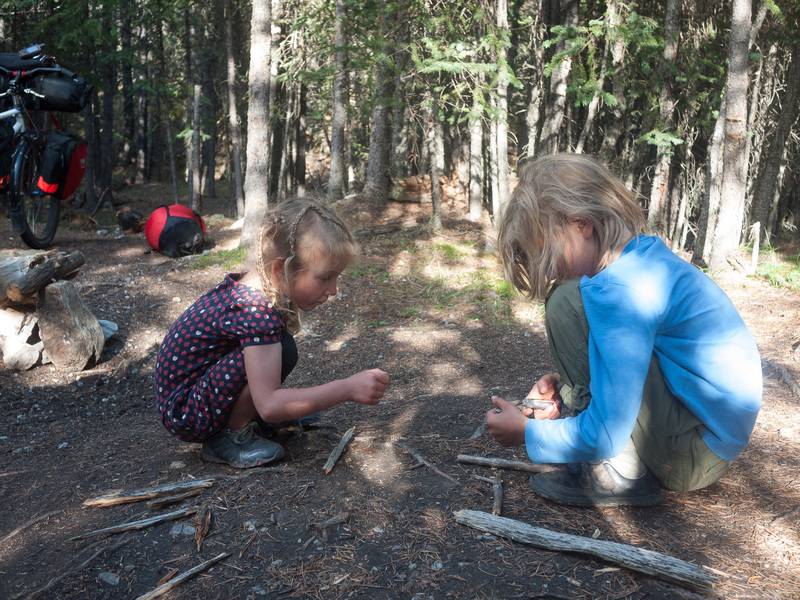 Elbow lake is a great family campground and there was another dad setting up camp with his kids when we got there. 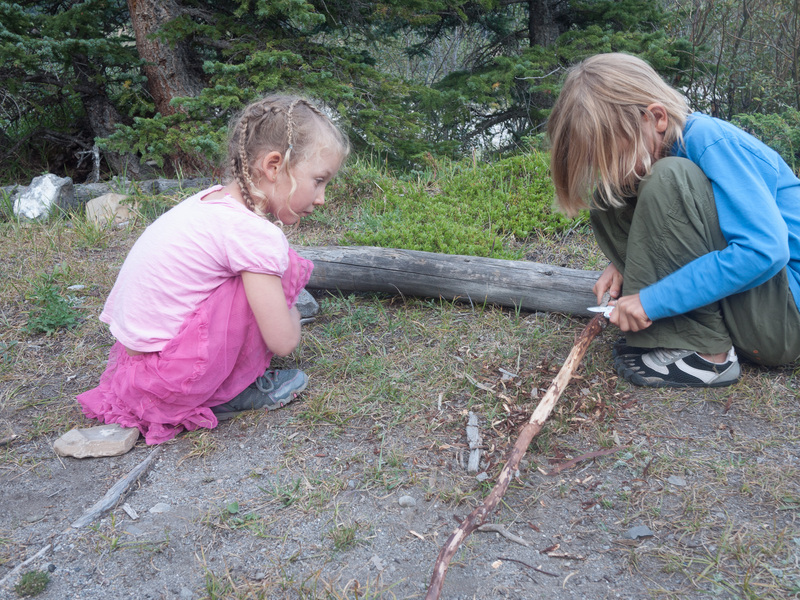 Tadhg and Fiona soon befriended Kyan and Ava and they did a bunch of kid things together. On our way out of the campground, I got Rob to snap a couple of pictures of Fiona and I and my loaded rig. Since I hadn’t gotten a way to fit the Piccolo on to my Mukluk, I had my old standby Rocky Mountain Hammer as my tow bike. It has a Cetma rack on the front of it which will carry a big pile o’stuff and I supplemented it with panniers as well as Porcelain Rocket front and rear bags and a pair of rear panniers. The rear panniers were probably the most annoying piece of equipment in that the very consistently failed to stay on, they are getting a new attachment system soon. I have also decided to have the Piccolo rack modified to fit the Mukluk which is a much better bikepacking rig. 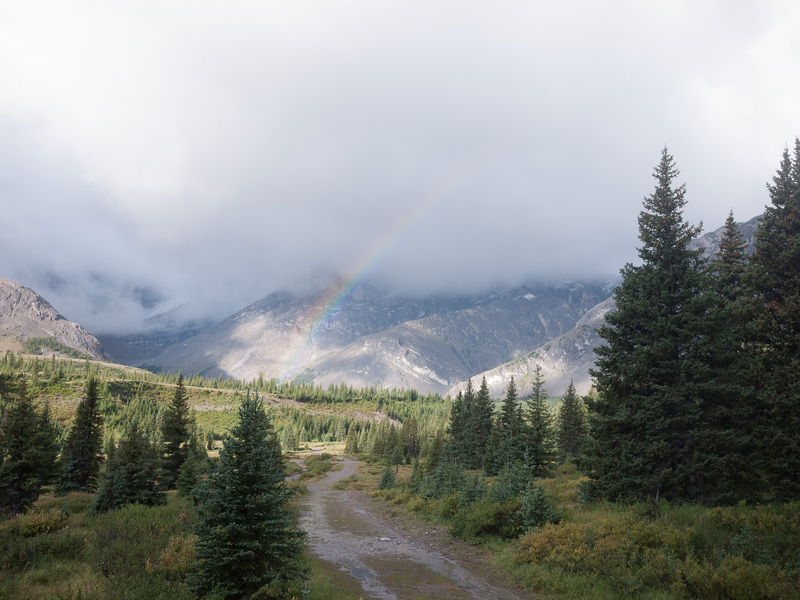 We hit the trail fairly early in the morning, since this was to be our longest day and I remembered the climb into Tombstone pass as very steep and long. 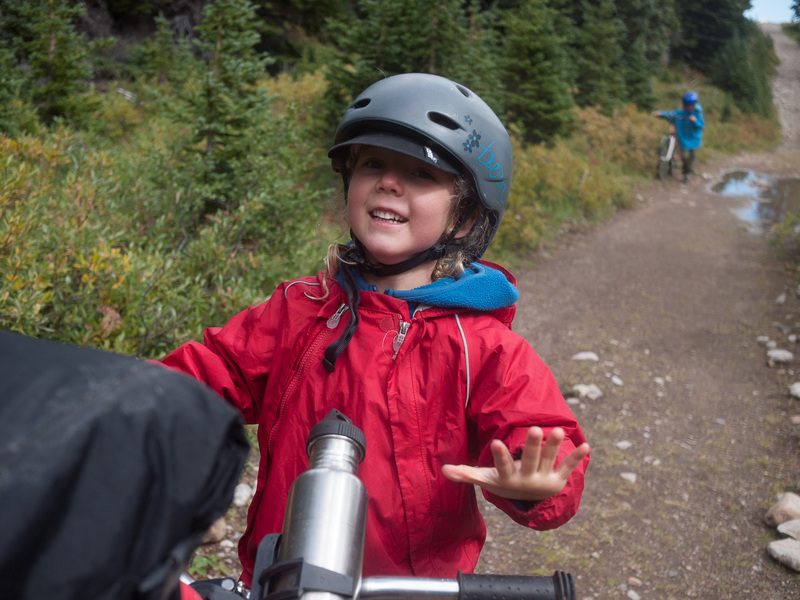 The trail through Elbow Pass was much easier on the descent, and even though Tadhg likes to be cautious on the downhills, he was riding most of it. Once we hit the bottom of the pass, we had the big climb from Tombstone campground to the top of Tombstone pass. Tadhg was moving pretty slow, and I needed to shuttle his bike up the last few hundred meters, but he soldiered on. 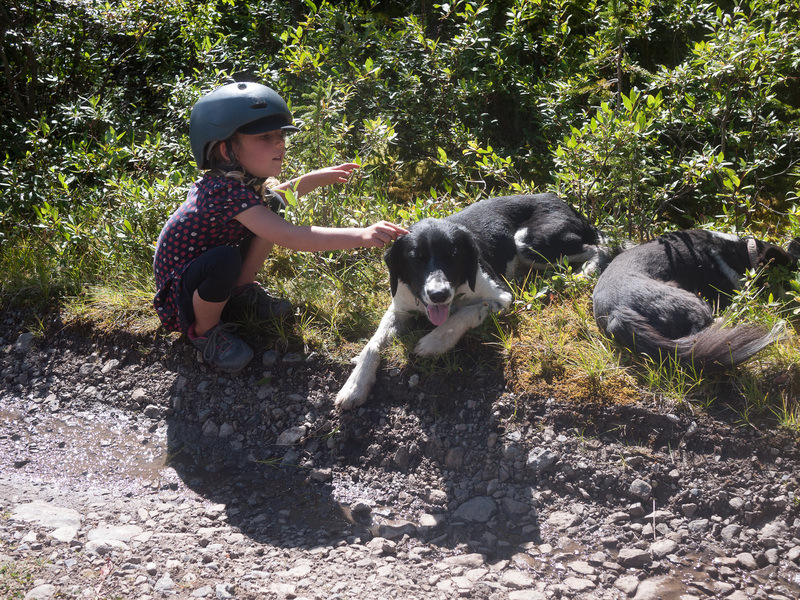 A convenient patch of wild strawberries near the top of the climb helped provide incentive. It was sunny and hot as well, which always makes climbing more challenging. At the summit, we celebrated by polishing off a whole pack of M&M candies or “motivation pills” as I like to call them. They are a tremendous inspiration for my candy deprived kids. Tadhg was all for enjoying the almost entirely downhill stretch to the Romulus campground. 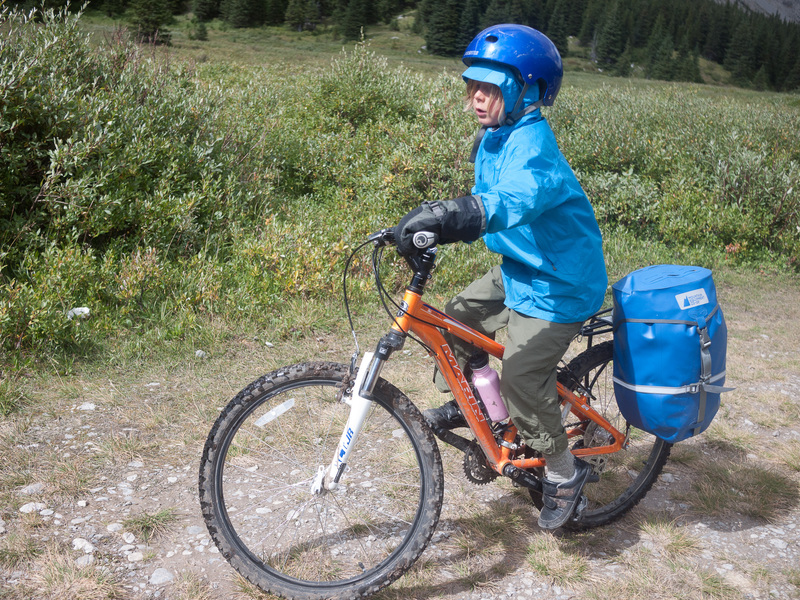 A few km flew by in minutes as Tadhg let go of his fears and his break levers for a brisk descent to the campground. Tadhg claimed at the end of the trip that this had been his favourite day. Funny how perspectives can be so different. I remembered mostly the climbing, he mostly the descending. The hiking/biking side of the campground was empty aside from ourselves, and we got the same site that we had when we had visited in early July. The kids therefore played “store” just like they had in July. Our accommodations for the trip were not quite dialled as far as weight is concerned. My MEC Tarn 2 tent weights a portly 2.7kg. This is about 2kg heavier than the lightest of shelters on the market today. The Tarn is waterproof and very tough and I own it, it is a good shelter, just not ideal for bikepacking. I also had along my Hennessy hammock which is very light and comfortable but only sleeps one. Tadhg and Fiona took turns in the hammock and the other one slept with me. All of my shelter seemed trivial when we took a walk to the equestrian side of the campground. Several families were set up with covered wagons and horses to pull them. It was pretty much exactly like an RV park with the adults sitting around on their folding chairs drinking wine dispensed from the red and white boxes set up on their portable kitchen counter. They had actually brought bikes (dept. store junk) in, not as vehicles but as toys for the children who were playing baseball using gloves and bats, not rocks and sticks. Tadhg awoke on the last day a little reluctant to get going. He was looking forward to seeing his mom, but he seemed to be sad that the trip was ending. 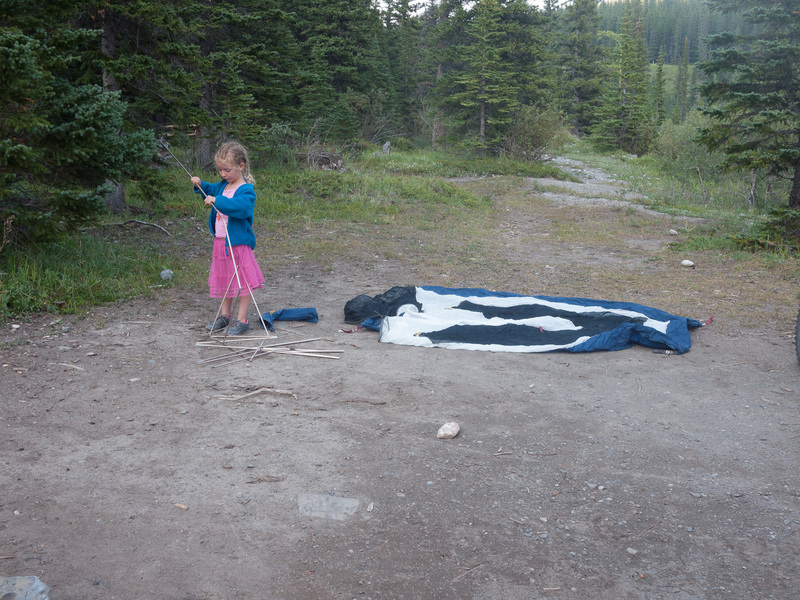 We took the tent down around him while he eventually put on some clothes and got out of his sleeping bag. Fiona is a morning girl, and she was up with the sun and ready to go. Previous post: Winter Fatbikepacking With a 9 Year Old. 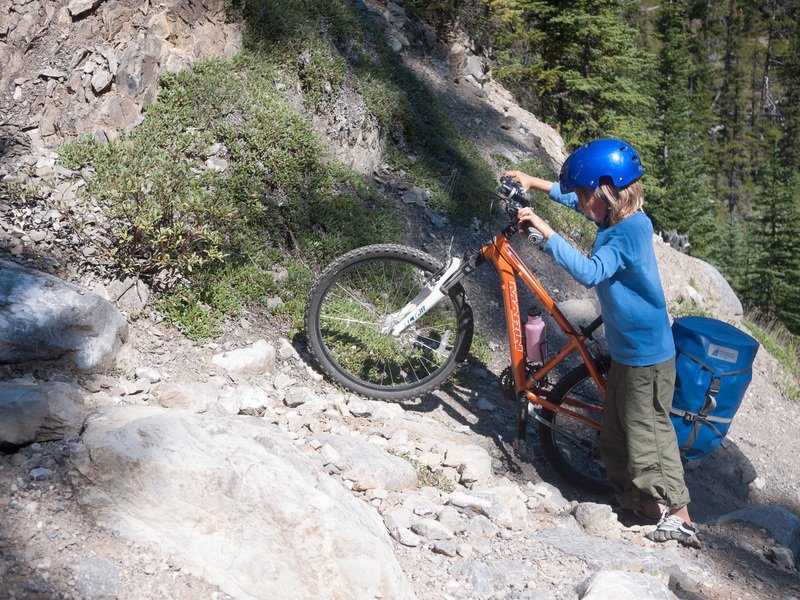 Awesome trip….what do you figure you range would be with the Muk+trail-a-bike? I’d like to say on a medium difficulty trail, but then we need to define what that means. The limit is pretty variable. I can do the whole Elbow Loop in a day, but the kids like to stop quite often to play and eat. Tadhg was our limiting factor on this trip but we did less than half what he could have done in back to back days and he has increased his strength quite a bit since then. On the winter trip he put in a 24km day, which would be roughly 50km of summer trail riding. My estimate is about 150 km of prairie riding, 100km of rail trail or mountain highway, or 50 km of moderate trail. Technical riding is where we fall apart a little, but I can push the loaded rig at a really good pace. 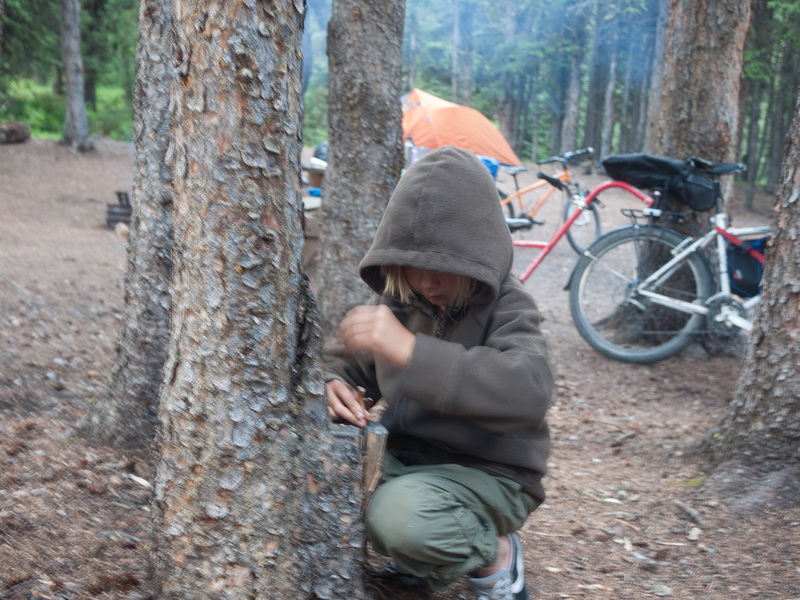 I am also taking a bunch of extra weight off the total with lighter shelter and sleeping bags etc. As a Calgarian, it’s awesome to see the amount of adventure to be had in the surrounding area. Happy riding, perhaps we will meet on the trail one day! The Cetma rack is the only one I would use with such a ridiculous load. I have an OMM rack and they are really tough, but they aren’t as ridiculous as the cetma. I am in the process of taking many pounds off my setup and I won’t be using the CETMA for off-road this sprinng. So far, I have taken about 15 pounds off my base weight. There will be a blog post here in the next month or so talking about my weight reduction plan. Looks like a great trip. 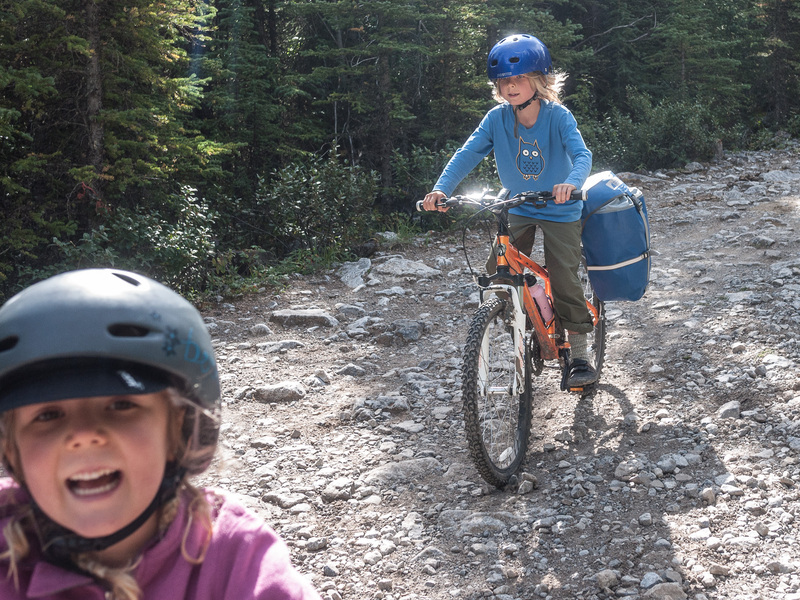 I’m planning to do some bikepacking this year with my kids. 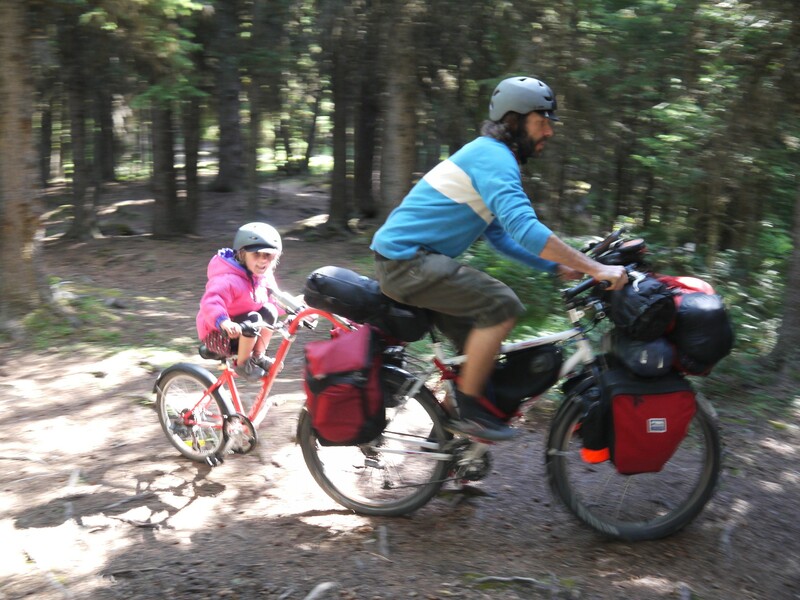 We have lots of back packing and cycling experience but no bikepacking experience yet. We do quite a bit of backpacking as well. Anything that gets us outdoors wins.